Crossposted from Justice Roars. 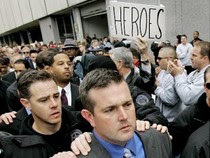 Few in New Orleans can forget the sight, in January of 2007, when New Orleans police officers involved in the killings on Danziger Bridge walked into Central Lockup on to be booked on murder and attempted-murder charges. The accused were surrounded by two hundred or more other officers, who came to show their support, cheering and applauding and hugging the officers who had shot down unarmed civilians in cold blood. Yesterday, a similar scene played out in New York City. According to the New York Times, hundreds of officers came out to applaud and support sixteen officers who faced a combined total of more 1,600 criminal counts. While the majority of the charges stemmed from widespread ticket-fixing, officers were also accused of drug offenses, grand larceny, attempted robbery, and more. New York's Patrolmen’s Benevolent Association, the union for NYPD officers, was deeply involved in the alleged crimes. According to the Times, "During the investigation, overseen by the Bronx district attorney’s office, prosecutors found fixing tickets to be so extensive that they considered charging the union under the state racketeering law as a criminal enterprise, the tactic employed against organized crime families." Similarly, PANO, the officer's union in New Orleans, was closely connected to the Danziger officers. The hundreds of NYPD officers engaged in what the Times called, "a stunning display of vitriol," against prosecutors, and also displayed hostility towards the press, "blocking cameras from filming their colleagues, in one instance grabbing lenses and shoving television camera operators backward." While there, officers also yelled insults at welfare recipients who were lined up at a facility across the street. The lessons from New Orleans' struggle against police violence are relevant to today's scenes from New York City. On September 4, 2005, two innocent civilians were killed and four were wounded. Seventeen-year-old James Brissette died from several bullets in his back, fired by NOPD officers. Lesha Bartholomew, also 17, was shot in the back while she lay on the ground, attempting to shield her mother's body with her own. NOPD officers were defending these actions. The officers involved in the Danziger killings were finally convicted this year. If their fellow officers had not stood behind them and defended them, despite the evidence of their involvement in murder, they would no doubt have faced justice sooner. As described in the Times, the officers' behavior showed they were not on the side of law, but on the side of their fellow officers, right or wrong. Forming a wall four deep in the main foyer, they applauded as the defendants appeared. The indicted officers waved and pumped their fists. A court official who came out to calm the crowd drew insults...On the street outside the courthouse, some 350 officers massed behind barricades and brandished signs...When the defendants emerged, many in the crowd burst into raucous cheers. Once they had gone and the tide of officers had dispersed, the street was littered with refuse. Despite the progress made in New Orleans, there are still no officers who have come forward proactively to report wrongdoing by their fellow officers. It's no wonder people in New Orleans, New York, and around the country are seeking alternatives to policing. Jordan Flaherty is a journalist and staffer with the Louisiana Justice Institute. His award-winning reporting from the Gulf Coast has been featured in a range of outlets including the New York Times, Al Jazeera, and Argentina's Clarin newspaper. He is the author of FLOODLINES: Community and Resistance from Katrina to the Jena Six. He can be reached at neworleans@leftturn.org, and more information about Floodlines can be found at floodlines.org. For speaking engagements, see communityandresistance.wordpress.com.